While the first foods that come to mind when you think of calcium might be dairy products, there are plenty of other calcium-rich foods besides milk, cheese and yogurt. One such example is broccoli. Dark green vegetables such as broccoli can contain high concentrations of calcium, along with other nutrients, and provide a host of benefits. Calcium is a mineral that plays a vital role within the body. Its main roles include keeping your bones and teeth strong, helping with blood clotting and nerve signaling, muscle contractions, regulating heart rate and releasing hormones. Adults between ages 19 and 50 need around 1,000 milligrams of calcium daily, while women over 50 and men over 70 need a little more -- 1,200 milligrams daily. Broccoli can go toe to toe with many healthy dairy products when it comes to the amount of calcium per serving. 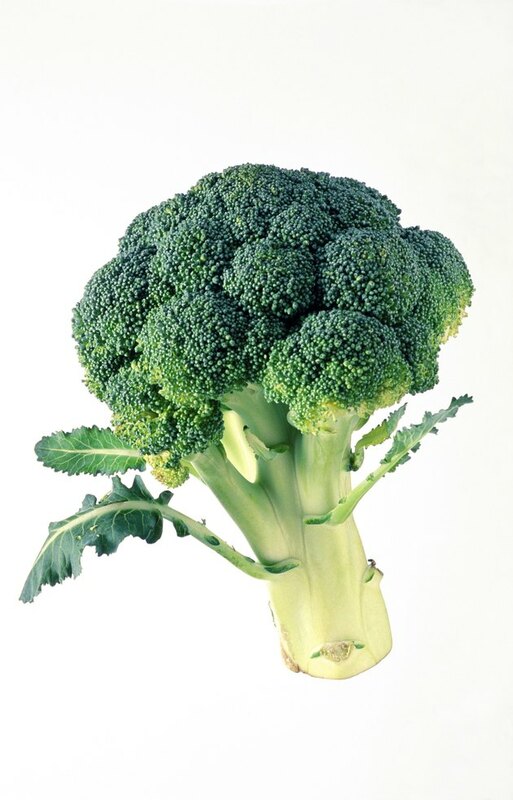 A single cup of broccoli provides 180 milligrams of calcium, which is 18 percent of an adult's recommended daily intake. A cup of cottage cheese, on the other hand, provides just 130 milligrams, while 1 ounce of brie has 50 milligrams and 1 cup of milk has 300. Plenty of other green vegetables are also high in calcium. Arugula has 125 milligrams per cup, spinach has 240, okra has 100, while turnip greens and dandelion greens have 80 each. Some other foods are also either fortified with, or naturally high in, calcium. Fortified cereals, for instance, can contain between 350 and 1,100 milligrams per 3/4 to 1 1/3 cup. A cup of cooked rhubarb has 348 milligrams, the same amount of soybeans has 261 and a 3-ounce serving of sardines has 325. Look to include a range of calcium-rich foods in your diet. Broccoli is a good choice, but if you're not too keen on the flavor or texture, try serving it with a little olive oil and some chilli flakes or blending it into a soup. Alternatively, choose other dark green vegetables, along with low-fat dairy foods. One other factor to consider is vitamin D. Your body needs vitamin D to help it fully absorb calcium, and the recommended daily intake is 400 to 800 international units for those under 50 and 800 to 1,000 for those 50 and above. The good news is that many calcium-containing foods, such as milk, salmon and fortified cereals, also contain vitamin D.
Can Pregnant Women Eat Cottage Cheese?